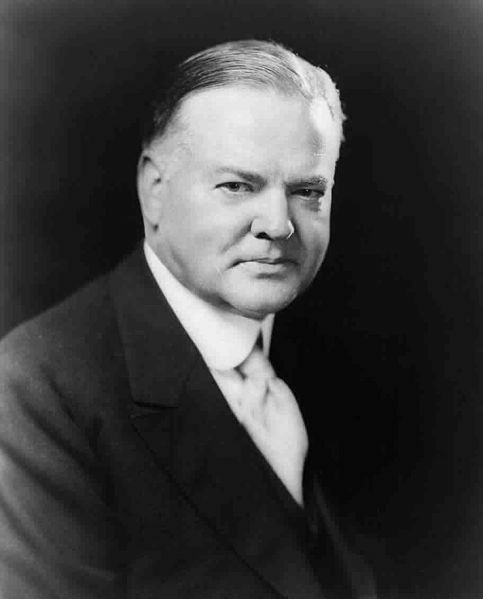 Herbert Hoover was president when the stock market crashed in 1929. While history books sometimes portray Hoover as an advocate of laissez-faire policies, his administration actually took numerous bold steps to intervene in the economy. He encouraged businessmen not to cut production or lay off workers. He asked farmers to voluntarily cooperate to raise prices, while also increasing federal farm subsidies. He called for an international moratorium on debts. He asked Congress to increase spending on public works projects and to increase funding for banks to prevent mortgage foreclosures. He also oversaw the creation of the Reconstruction Finance Corporation. He repealed existing tax cuts and increased top tax rates from 25 percent to over 60 percent. But these efforts by the federal government did not stem the economic disaster. One out of every four people was out of work, and homeless people lived in shanty-towns called “Hoovervilles” in many cities. The Gross National Product had fallen from a high of over $100 billion in 1929 to $55 billion. “I shall not evade the clear course of duty…. I shall ask the Congress for the one remaining instrument to meet the crisis—broad Executive power to wage a war against the emergency, as great as the power that would be given to me if we were in fact invaded by a foreign foe” (Franklin D. Roosevelt, “First Inaugural Address,” March 4, 1933). With a grant from Congress, domestic problems would be treated on a par with foreign invasion. President Franklin D. Roosevelt was elected to four terms and tried to end the Great Depression with the Progressive policies of the New Deal. In the first hundred days of the new administration, Congress quickly approved a wide variety of programs known as the First New Deal. The National Industrial Recovery Act, along with the Agricultural Adjustment Act, were considered the major actions of the first hundred days. All significantly increased the size, reach, and administrative character of the federal government. After the 1934 election, FDR worked to extend New Deal reforms through measures designed to provide more benefits to some at public expense. 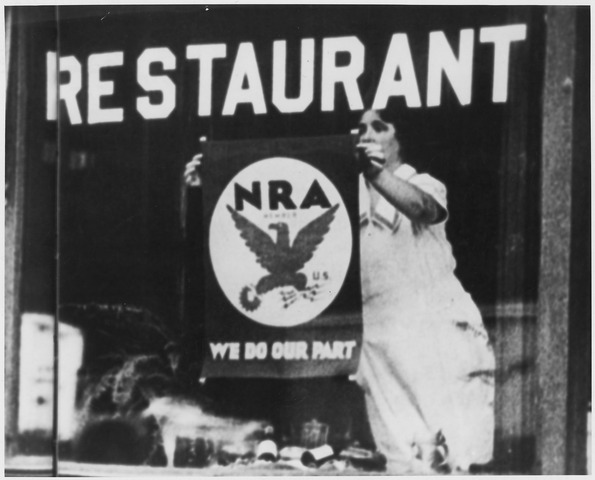 Extensive public works projects, the Social Security Act, increased income taxes on the wealthy, and several programs intended to help farmers, laborers, and the unemployed made up the Second New Deal. The National Industrial Recovery Act (1934) was part of the New Deal regulation of private enterprise. At first, the Supreme Court struck down most of the new laws that made up the First New Deal as outside the constitutional powers of Congress. In response, Roosevelt proposed the Judicial Procedures Reform Bill of 1937. This law would have allowed the President to appoint a new justice to the Supreme Court for every sitting justice over the age of 70. This would allow the President to appoint up to as many as six new members of the high court. Speaking to the American people in one of his radio broadcast “fireside chats”, Roosevelt warned that a failure to pass sweeping laws would leave everyone vulnerable to economic ruin. “National laws are needed to complete [our recovery] program. Individual or local or state effort alone cannot protect us in 1937 any better than ten years ago” (Franklin D. Roosevelt, “On the Reorganization of the Judiciary.” March 9, 1937). Delivering his State of the Union address during his third term as President, FDR said, “People who are hungry and out of a job are the stuff of which dictatorships are made.” The rights protected by our Founding documents, he said, had “proved inadequate to assure us equality in the pursuit of happiness.” (Franklin D. Roosevelt, “State of the Union Address,” 1944). Roosevelt stated, “All of these rights spell security. And after this war [WWII] is won we must be prepared to move forward, in the implementation of these rights, to new goals of human happiness and well-being” (Franklin D. Roosevelt, “State of the Union Address,” 1944). The “rights” in FDR’s list differ substantially from the rights in the U.S. Bill of Rights. The natural and inalienable rights in the U.S. Bill of Rights are mostly negative. This means that they stop interference by others or by the government with the individual’s freedom to act (e.g. believe, worship, speak, and publish freely, defend oneself, remain silent, acquire property, etc.). But they do not require the government to bestow material benefits upon the citizenry. The new rights FDR proposed, however, were positive, such as the “right” to a well-paying job, a “decent home,” or a “good education.” Rather than protecting the individual’s natural freedom, FDR’s list of rights was a set of things people were owed—entitlements and services the government would, in theory, provide to certain individuals at the expense of certain others. In other words, the assurance of the “new” rights would come at the expense of the “old.” They would authorize the government to limit liberty. Many believe that human dignity requires that we all have the responsibility to love our neighbors and care for each other with charity. But in the “Second Bill of Rights” FDR was advocating, rather, that these moral duties should be transformed from individual responsibilities into government-guaranteed rights. It would no longer be your family’s responsibility to ensure you had a decent home and good education, for example, but the government’s obligation, paid for by taxes. The president is not a legislator; the most he can do is “recommend measures” or propose laws to the lawmaking body, Congress. The rights in Roosevelt’s “second bill of rights” were not taken up as constitutional amendments, but Congress attempted to secure many of them legislatively. In fact, some of those attempts were underway before the “second bill of rights” speech was given in 1944. By first recommending laws and then signing or vetoing them, the president has a very important share in law-making, even though he is not designated a legislator. 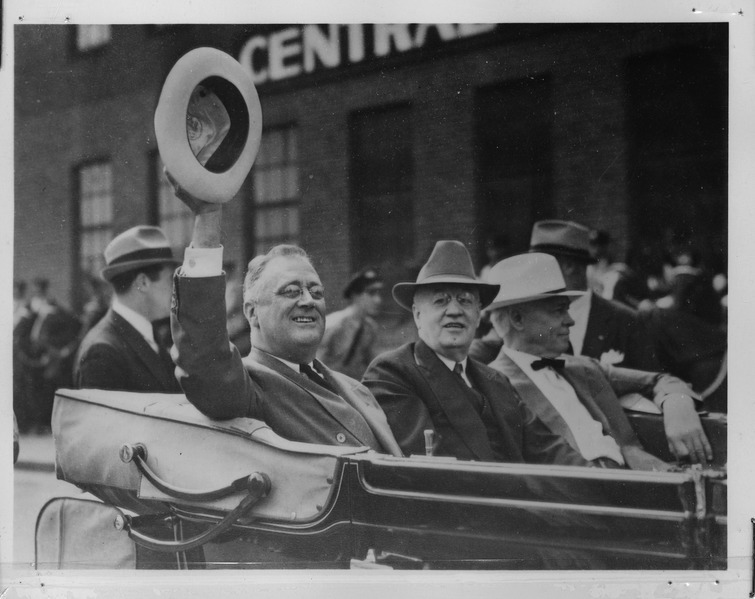 Roosevelt went on to be elected to a fourth term in 1944, after his already-unprecedented third term. He died in office in 1945. The Twenty-Second Amendment was ratified in 1947, limiting the number of times someone can be elected president to two. Here was another change in the original Constitution; Hamilton had given reasons in Federalist No. 71 and Federalist No. 72 for the indefinite re-eligibility of the president (Alexander Hamilton, Federalist No. 71 and Federalist No. 72, 1788). Roosevelt had observed in 1937, “Among men of good will, science and democracy together offer an ever-richer life and ever-larger satisfaction to the individual. With this change in our moral climate and our rediscovered ability to improve our economic order, we have set our feet upon the road of enduring progress” (Franklin D. Roosevelt, “Second Inaugural Address,” January 20, 1937). Once the nation had finished fighting World War II, this progressive vision of government as existing in part to provide people with the tools for an ever-enriching life would be taken up again.